The highlights included the new Curb Your Hunger which added food trucks to the mix of restaurants to celebrate our growing food truck culture here in Edmonton and getting more involved in social media by having 2 ATCO Gas Cook Off events involving food bloggers. One was a best food truck entrée cook off, and one a "Cooking with the Stars" BBQ competition where food bloggers were paired with some of Edmonton’s finest chef’s to come up with amazing creations from a basket of mystery ingredients. As well, they eliminated the Taste of Dessert. Thankfully, we were able to visit twice to taste a variety of offerings and compare it with last year’s. Although the weather was less than ideal, which meant no pictures of yours truly for fear I would wind up a wet sponge, at least I got to taste a few things. 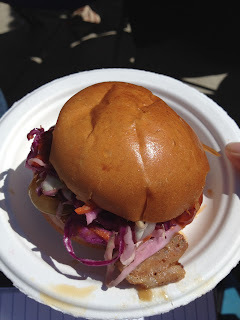 Some of the highlights for Moo and my humans included the bacon bomb from Smokehouse BBQ. It was piggy goodness with a barbeque sauce that gave it some kick. 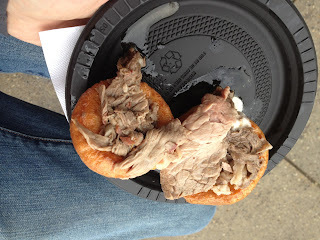 The humans also enjoyed the Prime Rib Stuffed Mini Yorkshire Pudding from On The Rocks. They said the portions were very generous, with each Yorkshire pudding overfilled with tender, juicy feeb, with a squirt of horseradish sauce giving it a kick. In fact, the line up for On The Rocks offerings was constantly long, and it seems with good reason. They also enjoyed the whiskey and dark chocolate ribs from Share Restaurant at The Westin Hotel. They thought they were smoky and the meat was fall off the bone tender, but did wish they could taste at least a hint of the whiskey and chocolate marinade. The tandoori chicken samosa and potato bhajia (fritters) from Guru Fine Indian Cuisine were very filling and flavorful. 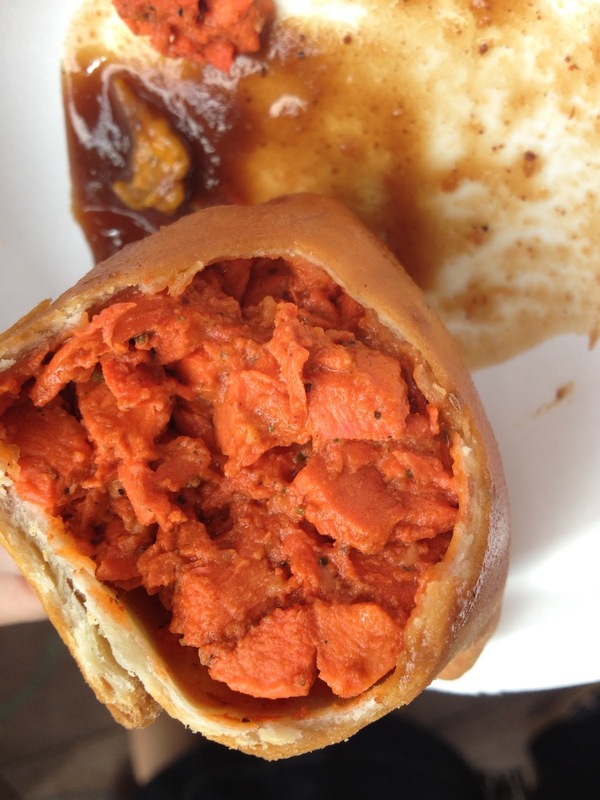 The samosa was extremely large and crispy without being greasy, while the chicken inside was very moist. The fritters were also crispy, with the chickpea batter adding a unique flavor of it’s own to the potatoes. One item that never disappoints it the Café Affogatto from Zucchero Cappuccino Bar. A very simple dessert of vanilla ice cream or gelato, with espresso poured on top of it, and lightly topped with whip cream and a drizzle of chocolate sauce. It makes for a dessert that isn’t too sweet, and gives you a caffeinated jolt. 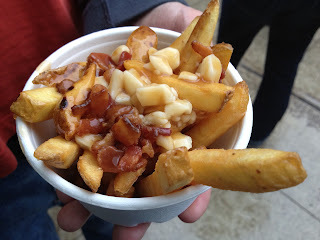 Some dishes that were a bit of a let down because they sounded so fantastic, but the execution wasn’t quite there included Hudsons Canadian Tap House’s Maple Bacon Poutine. We were hoping for a more prominent maple and bacon taste, instead of the small amount of bacon garnish on top and the hint of maple in the gravy. Although the fries were nice and crispy, frying them in bacon fat might have helped to make the dish taste more like bacon. The gravy was also a bit thin and didn’t cling onto the fries, and they definitely could have put more cheese on it, as there was very little cheese. After trying On The Rocks’ Prime Rib Mini Yorkshire Pudding, I had high hopes for their Jack Daniels Apple Crumble with Ice Cream. Unfortunately it wasn’t nearly as good as their Yorkshire pudding. 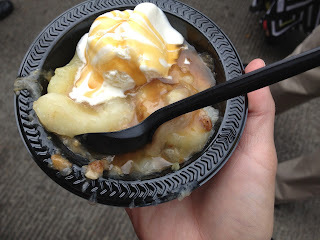 Although the apple crumble had a nice balance of tartness, sweetness, crunch and softness from the baked applies, I had hoped that there would be a bit more crumble than there was, and that the Jack Daniels would taste more prominent in the sauce. 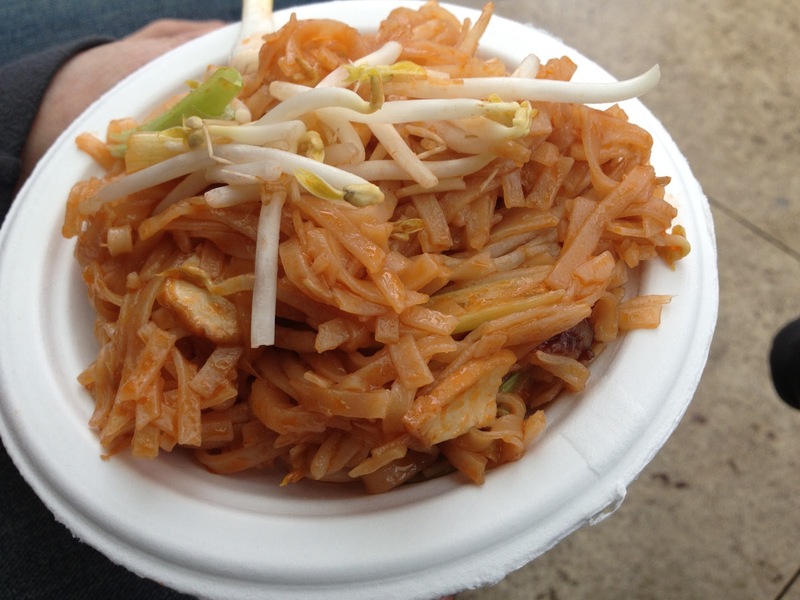 The only dish that we didn’t finish because it downright didn’t taste right was the pad thai from Numchok Wilai Restaurant. The texture and flavor reminded me more of Thai Kitchens Original Stir Fry Rice Noodles with Sauce, as opposed to something freshly made. There were still many restaurants serving the same item as they’ve served for the few years, and I hope that they’ll take the opportunity in future years to switch things up and try something new. Although I suspect they are likely worried about losing repeat customers if they don’t offer the items people have come to expect from them. Overall, I was pleased to see so many new restaurants and new dishes available this year. The additional events such as the food blogger cook offs added something new, fresh, and fun to this year’s festival. I look forward to seeing what they come up with next year and hope that many more restaurants will embrace using this venue as an opportunity to try and offer something new and unexpected.